Sweet and tangy, this fresh and healthy Kansas Caviar dip is an appetizer recipe made for scooping! The first time I had this recipe was in Iowa last Christmas with my boyfriend and his family. His sister came over for a family game night and brought a huge bowl of this with tortilla chips. They called it Kansas Caviar. We sat down on the couch and ate the whole thing before we started Cards Against Humanity. The second time I had it was in August when I was home for my sister’s wedding. A really good family friend has been making it for years because my mom loves it. She calls it Texas Caviar. My mom asked her to make a triple batch for the weekend festivities. While the bridesmaids were getting ready on Saturday morning we ate the whole thing. P.S. It’s especially delicious with mimosas?. Most recently, my cousin made a version of it for a Christmas potluck at the beginning of December. 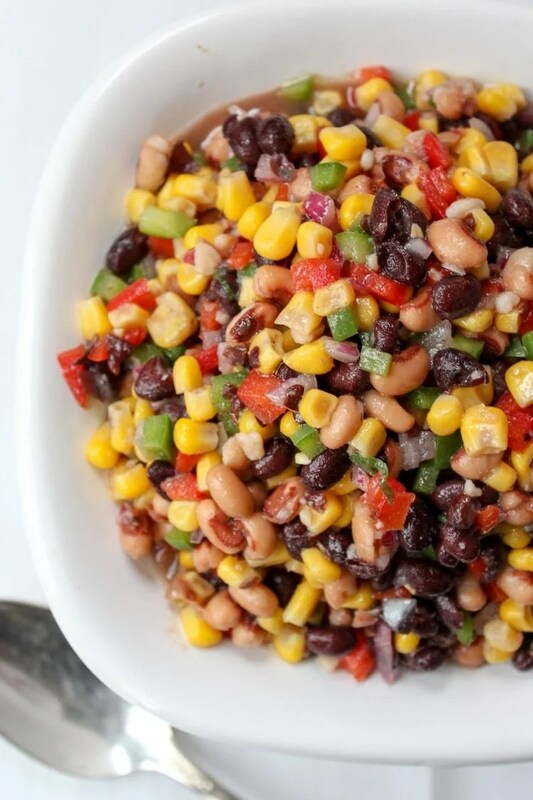 She called it Cowboy Caviar. Let’s just say she came home with an empty bowl. Wether it’s Kansas, Texas or Cowboy Caviar this stuff is like crack. 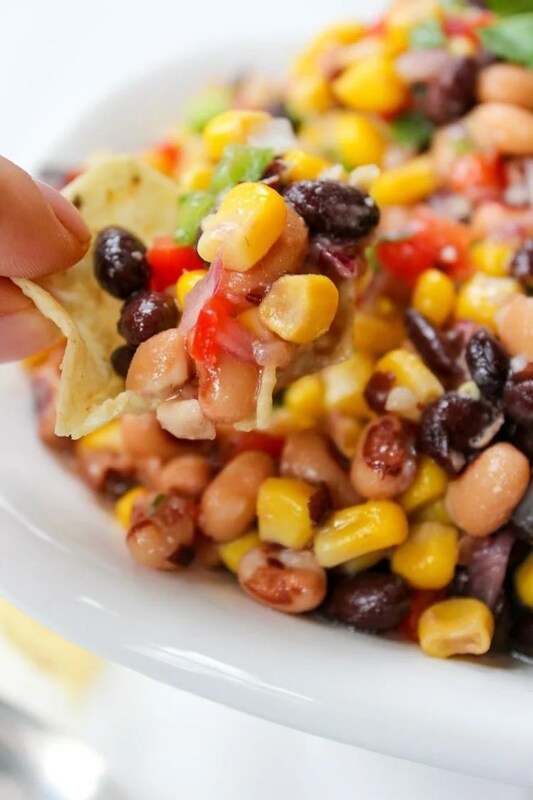 The second you start scooping you will have to pry those tortilla chips out of your hands before you stop. 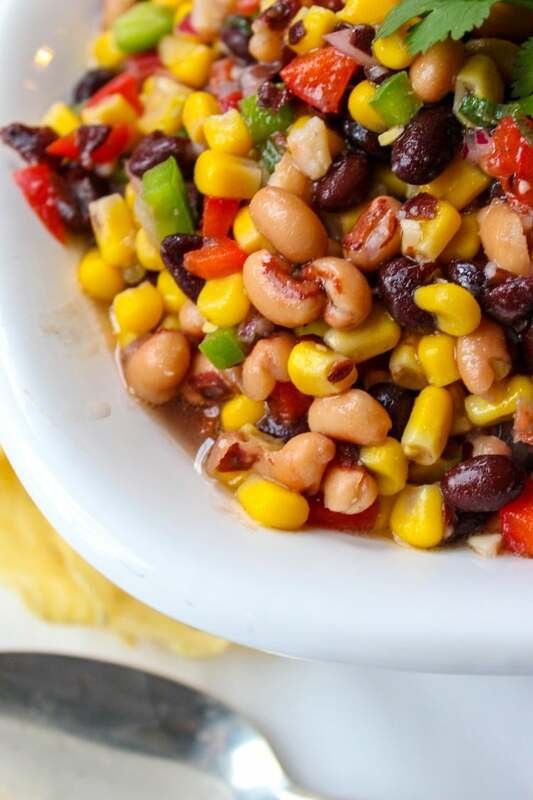 The creamy texture from the beans and the crunch from the peppers make the perfect texture. I love the sweet hint from the sugar and the tangy punch the vinegar gives you. When you have to marinate a recipe in the fridge for 24 hours you know it’s going to be good. Kinda like sangria. The longer it soaks in all the yummy juices, the better! If you like a kick of heat, finely chop a jalapeno and add that to the mix. I made this for a Christmas appetizer and no one in my family likes heat, but if you’re a spicy kinda person/family, go crazy. The delicious to easy ratio of this recipe is perfecto. It’s fool proof all the time, takes about 15 minutes to throw together the day before and you’ll have a killer dip for your party or gathering. It’s an awesome recipe for New Year’s Eve celebrations and family gatherings. It makes a large batch and it’s no fuss because you do it the day before. You can even customize it to your liking? 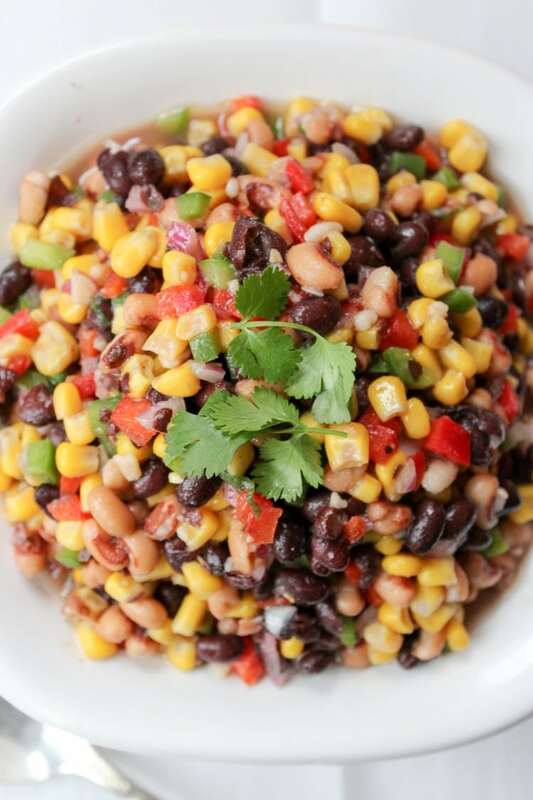 Want to add hominy with the corn? Go for it. Want to add a orange pepper instead of a red pepper? No one is stopping you. When is it a bad thing to be able to add or omit ingredients to your liking? Ummm…never! Plus, the colors in this recipe are so pretty and vibrant! It looks so good, but it tastes even better. Add all of the ingredients, except cilantro, to a large bowl and mix well. Cover and let sit overnight in the fridge to marinate. Add cilantro and mix well before serving. Serve with tortilla chips (I recommend the scoops to get as much dip as possible). Great question, Lisa! I used an extra virgin olive oil!